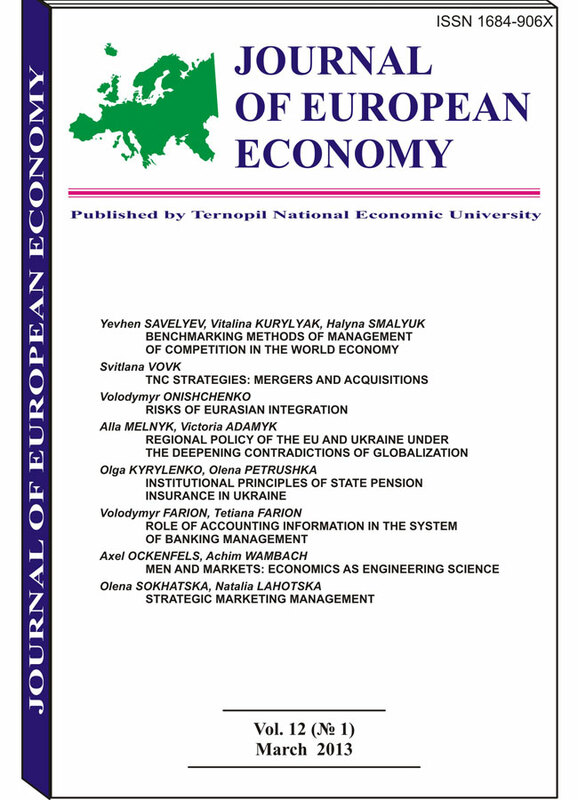 The paper presents the essence, the prerequisites of mergers and acquisitions; it singles out modern trends of mergers and acquisitions, namely the development of the social component of enterprise integration; also the operations are analyzed in merges and acquisitions throughout the whole world and in Ukraine, in particular. The basic political, institutional and economic risks while creation of the Eurasian Economic Union and their possible impact on its stability and efficiency of development is proved; the author’s position regarding the impossibility of the long-term socio-economic effects for the members of the Union is grounded; the probable risks for Russia as the leader of the integration process which prevent the Eurasian integration are identified. Risks, integration, disintegration, Eurasia, Eurasian Economic Union, uncertainty. The problem of the EU regional policy modernization under the conditionsof globalization processes activation is studied. The influence of global factorsand changes in the EU regional policy is determined produced on the transformationof the regional policy in Ukraine. In the context of the development of theUkraine’s regional policy the problems are defined of economic development andwelfare of the citizens in the regions of Ukraine, also the areas of cooperation betweenUkraine and the EU are outlined. Theoretical basis of institutional provision of the state pension insurance is investigated. Structure and content of formal institutions that regulate state pension insurance during the period of pension reform in Ukraine are analyzed. The basic informal institutions of the state pension insurance in our country are described. 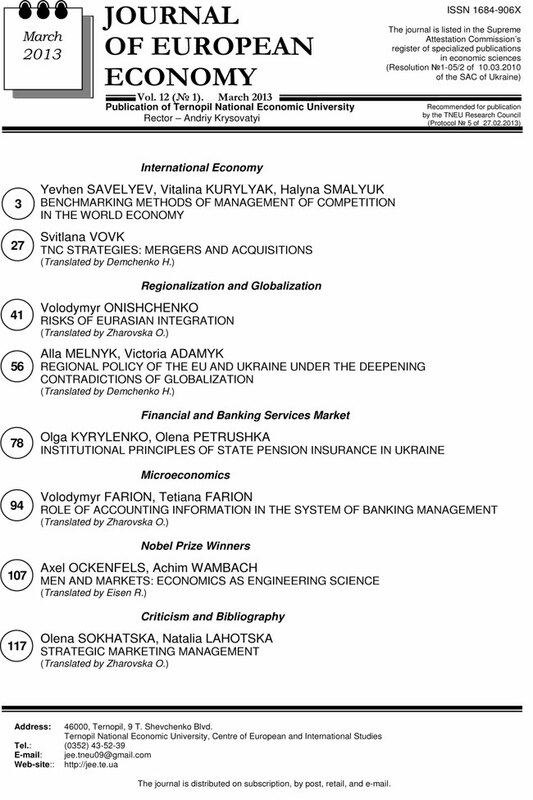 It was done a research on correspondence between informal institutions and official rules and regulations that determine the activity of the subjects of state pension insurance in Ukraine. State pension insurance, institutions of state pension insurance, pension reform, formal institutions of state pension insurance, informal institutions of the state pension insurance. The 2012 Sveriges Riksbank Prize in Economics (Nobel Prize in Economics) was awarded jointly to Alvin E. Roth and Lloyd S. Shapley «for the theory of stable allocations and the practice of market design». With their works the two economists have laid the foundation for a new research field: market design. The regime evolution of fiscal policy in the EMU indicates an internal con-flict between ensuring of the convergence and flexibility to adapt to asymmetric shocks. The convergence criteria, which precede the introduction of the Mone-tary Union is a formal basis for limiting the discretionary fiscal decisions, but they are not sufficient to create the institutional regulators of fiscal policy that is con-sistent with a single central bank operation. The transition from the Maastricht cri-teria to the Pact of Stability and Growth showed an attempt to combine the fiscal flexibility and responsibility under the relevant rules. However, this scheme proved to be vulnerable to the possibilities of opportunistic behavior and asym-metric penalty sanctions. Empirical analysis proved the lack of fiscal conver-gence in the integration area that manifested itself in the automatic stabilization of asymmetric fiscal policy during the phases of the business cycle in the context of the countries. The debt crisis in the EMU gave an impetus to the introduction of the system of harder fiscal rules, which, however, is not a return to the ideol-ogy of the Maastricht criteria. 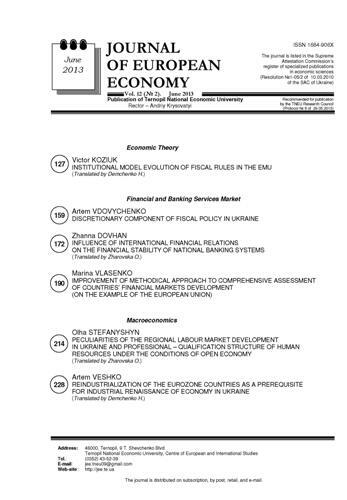 Fiscal rules, institutional constraints, convergence criteria, EMU, debt vul-nerability, fiscal reforms. In the article author sets a goal to assess cyclically adjusted budget bal-ance (CAB) in Ukraine and employ this indicator for analysis of fiscal policy cycli-cality. Parameters needed for assessment of CAB are estimated with application of VECM approach. 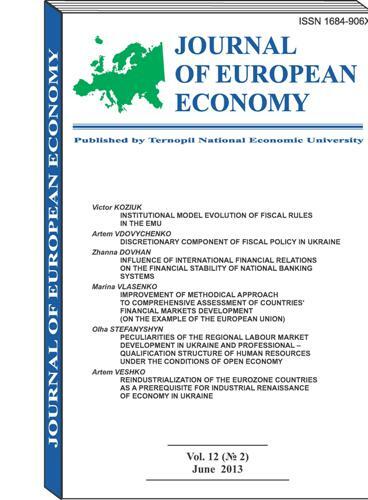 Results obtained lead to conclusions about procyclicity of fiscal policy in Ukraine accompanied with significant internal lags, what is con-firmed by estimates with usage of alternative government discretionary fiscal pol-icy measurements. Cyclically adjusted budget balance, discretionary fiscal policy, cyclicality of economy. The tendencies of influence of the global financial architecture on the fi-nancial stability of national banking systems are defined. The threats and possi-bilities for the provision of financial stability of the banking system (FSBS) arising from the impact of international financial relations on it are proved. The main fo-cus is paid on the identifying of the relationships between the level of financial stability of the banking system and the level of the external borrowings of the banking sector in Ukraine. Financial stability of banking system (FSBS), world financial architecture, globalization, international capital movement, reserve currencies, International Monetary Fund, loans. The theoretical generalization of countries’ financial markets development assessment issue investigation was conducted, potential factors of financial mar-kets development have been defined, the existing methods for assessment of countries’ financial markets development were reviewed, the shortcomings and their improvement necessity were revealed, the improved methodical approach to comprehensive assessment of (group of) countries’ financial markets devel-opment with the usage of the Composite Index as the instrument of assessment (in the example of the European Union countries) was offered. Assessment of countries’ financial markets development, potential deter-minant factors of development, methodical approaches to comprehensive as-sessment, Composite Index, countries of the European Union. The problem of territorial differentiation of the labor markets of Ukraine and professional and qualification structure of human resources in terms of formation of innovative employment is observed. It is determined that the development of the regional labor markets is mainly influenced by the demographic and eco-nomic factors. Based on the analysis of the contemporary structure of the re-gional labor markets, the reasons of its deformation are defined and the direc-tions of approval of innovative forms of employment using the state youth em-ployment programming are observed. Regional labor markets, professional and qualification structure, youth em-ployment, state social programming. Deindustrialization, reindustrialization, foreign direct investment, structural distortions. 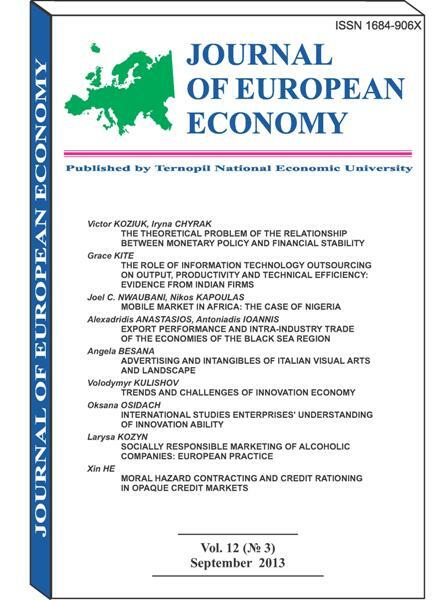 Journal of European Economy, Vol. 12, Number 3, September 2013, p 245-259. 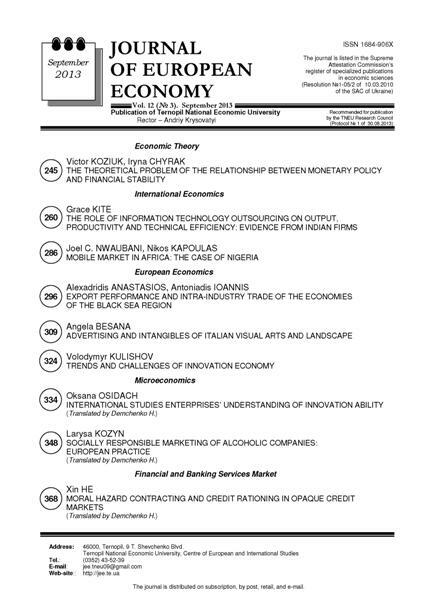 The research of theoretical problems of the relationship between monetary policy and financial instability in the context of the major areas of macroeconomic theory is implemented. It is found out that monetary policy not always can predictably affect the real and financial sectors because of the availability complex and nonlinear relationships between them. Monetary policy, financial instability, price stability, interest rates, money supply, inflation targeting, the business cycle, speculations. Existing econometric studies find that both information technology (IT) and outsourcing of goods and services production increase firms’ productivity. Until now, though, there has been no similar evaluation of IT outsourcing. This paper fills that gap using purchasing firms in India as a case study. It finds output elasticity for Software and IT Services (SWIS) outsourcing which implies bigger returns than those available from either general outsourcing or non-outsourced IT. There is also clear evidence that purchasing outsourced SWIS moves firms closer to parity with the most technically efficient firms. The paper concludes that outsourcing is a superior option for firms that wish to invest into IT and that in India it should be encouraged by policy. Information Technology, Software, Outsourcing, India. Africa is the world’s second largest mobile market after Asia. Based on the fact that the continent’s wide economic growth and an increasingly competitive marketplace, the number of subscriptions in Africa is set to reach one billion by 2015. The transformation of Nigeria»s telecommunications access since the licensing of three GSM networks in 2001 and a fourth one in 2002 has yielded a huge result. The country continues to be one of the fastest growing markets in Africa with triple-digit growth rates almost every single year since 2001. In this paper we carried a report containing a market overview and analysis, key statistics, regulatory issues and forecast for the mobile market in 2017. In conclusion we find out that Nigeria has overtaken South Africa to become the continent»s largest mobile market almost 100 million subscribers, but however, market penetration remains at only about 60% in early 2012 as a result of the global economic crisis, reinforced in 2010 but then declined again in 2011. Nigeria, mobile, market, subscriber, growth, gsm companies.